I would like to say from the outset that I am thrilled Godzilla is back on the scene. I miss the old movie monster days, and, from what I hear, Godzilla has paved the way for a new crop of films featuring our favorite monsters to arrive. Godzilla started wonderfully. It created a very interesting premise, one I found original. Bryan Cranston leant the start of the film quite a bit of depth and emotional resonance. The cinematography really astounded me with epic shots, lush locations, and intricate sets. Of course, I think it’s only fair that I mention I didn’t completely follow the storyline at first. That’s okay, though, they were setting up Godzilla’s big debut, so I could handle a little muddy water. Pretty soon we got our movie monster, but it’s not Godzilla. Instead, a giant parasite (that looks a lot like the creatures from the director’s other cool monster film – Monsters) wreaks havoc after its awakened. It’s searching for its mate, and its calls get Godzilla’s attention. As Ken Wantanabe’s character says, Godzilla is the alpha predator and it, along with nature, won’t allow any other giant monsters to exist. Ooookay. I’ll roll with that. Frankly, I just want to see Godzilla. Now, I understand the need to create suspense. They do a really good job at it, too. Once Cranston’s character took on less screen time, though, I very much became less engaged. Cranston’s character’s son is a military man and trying to get back to his wife and small son as the creatures invade San Francisco, his home town, but I didn’t care too much if he made it or not. I didn’t dislike Taylor-Johnson or Olson as the young husband and wife, but they didn’t elicit the sort of commitment Cranston garnered. Okay, so finally Godzilla appears, and he looks amazing. He’s got his old school look, but they also touched him up a bit and made him pretty horrifying. We get a great scene in the daylight where he almost destroys a bridge with school buses upon it, and then night comes. Because of that disappointment, I really can’t say I recommend the film. There were some very cool scenes, some amazing sets, and the special effects were top-notch, but at the end of the day, if you’re going to tease the star for the entire film, you’d better let us get a good, prolonged look at him as he displays his glory. 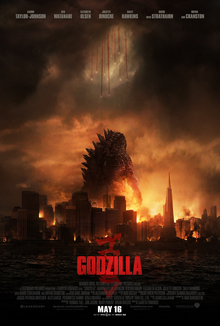 This entry was posted in Movie Reviews and tagged entertainment, godzilla, movie, review. Good review Scott. For me, I appreciated the fact that it at least built up its story, as well as its monster, before showing us everything. That kept me waiting and on edge, practically the whole time. I agree! Thanks so much for stopping by.